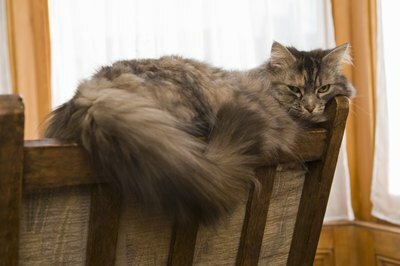 Comfortis for cats can make your cat comfy by keeping the fleas away. Your fuzzy feline is a treasured member of your family, and of course you don't want your family members dealing with the itchiness and misery of fleas. Comfortis for cats is a medication that your vet can prescribe to help you get rid of all those pesky fleas very quickly. Comfortis, which contains an active ingredient called spinosad, is available for dogs and cats. This medication comes in the form of a small tablet. Comfortis tablets for cats are beef-flavored and are chewable, but do not have to be chewed to take effect. Comfortis for cats is a flea treatment that was designed to both kill and prevent flea infestations for one month. When given once monthly, Comfortis is designed to keep fleas completely off your cat so that you won't have to deal with regular infestations at all. According to the Comfortis website, laboratory studies show that spinosad begins to kill fleas within 30 minutes after ingestion by attacking the adult flea's nervous system. Spinosad takes action by killing fleas before they are able to lay eggs and therefore reproduce. Comfortis dosage is dictated by weight. The pill is available in four different sizes, and your veterinarian will advise you as to the correct dosage for your cat. The manufacturer recommends one 90mg pill for cats from 2 to 4 pounds, one 140mg pill for cats from 4.1 to 6 pounds, one 270mg pill for cats from 6.1 to 12 pounds, and one 560mg pill for cats weighing between 12.1 and 24 pounds. Cats over 24 pounds will receive a higher dosage in more than one pill. Comfortis is most effective when ingested along with a meal, according to the product label. Cats must be over 14 weeks of age to take Comfortis for cats. Additionally, any cat taking this medication should weigh at least 2 pounds. The product's safety for pregnant, breeding or lactating female cats has not been evaluated, so make sure your vet knows if your cat falls into one of these groups. Comfortis: Is it Safe to Give my Dog or Cat Comfortis? How Fast Does Revolution Flea Control for Cats Work?